From the street it doesn't look like much, but if you get close enough the smell of rich sauces and savory meats will draw you in, and you won't be sorry. 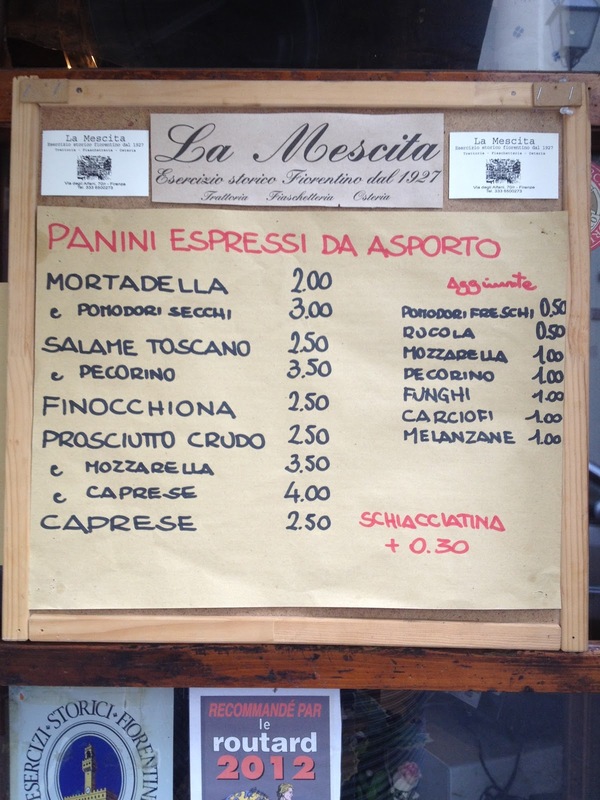 La Mescita is one of Florence's proverbial hidden gems -- a long-established eatery serving traditional Tuscan fare, hearty and seasonal. 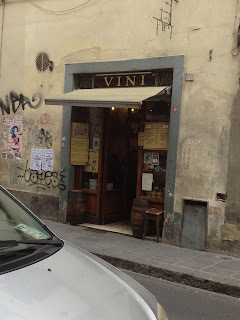 You won't find a menu in English or many tourists in the two dozen seats, but the staff is kind and helpful, the menu changes seasonally (as do the hours), and the food is delicious. Yesterday I had a plate of homemade tortellini in a fresh meat sauce. The ingredients -- veal, cheese, mushrooms, tomatoes -- were simple and classic. And the pasta was perfect. We shared a plate of regional cheeses and meats (salami toscano, mortadella, pecorino romano, prosciutto crudo) served with crusty Tuscan-style bread. And, of course, we had a glass of the house wine, too. Everything was fresh. Everything was locally produced. And it all tasted fantastic. 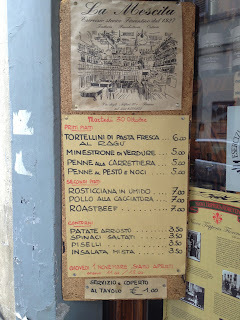 If you aren't in the mood for a sit-down meal (or if the place is full, as is often the case), they also do freshly made take-away panini from the counter. Another delicious option. 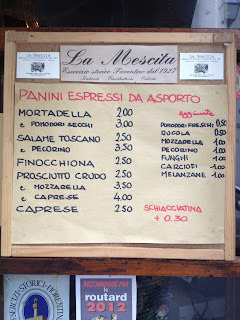 Located around the corner from the Accademia -- and around another corner from Florence's Friendliest Apartments where I am staying again -- La Mescita makes a perfect lunch stop after a date with Michelangelo's David. Sarita, I agree. The best places are often the hidden ones. We had a beautiful day today -- lots of sun. Hope you make it to Florence soon. Thanks for reading!